It's been a stellar year for live music in the D.C. area. Two days in particular will be remembered fondly by many concert-going Washingtonians: U2 graced us with their presence on September 29 (making many forget Lady Gaga was also performing in town that same night), while Virgin Mobile FreeFest hosted an incredible lineup on August 30 at no charge to the audience. 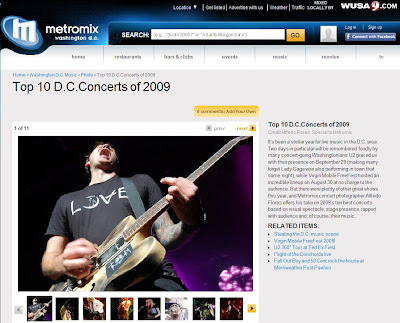 But there were plenty of other great shows this year, and Metromix concert photographer Alfredo Flores offers his take on 2009's ten best concerts based on visual spectacle, stage presence, rapport with audience and, of course, their music.